Most home inspectors know that we need to objectively report our findings. For me this includes not mumbling “what the heck?” under my breath, and being mindful of my body language such as facepalms. However, when I walked into this bathroom, my tact fled, and my face and palm met with a loud smack. The first thing you notice, is that this bathroom is brand new. It was originally a laundry room that the owner converted into a bathroom. The first and obvious thing you notice is the service (electrical panel). Electrical panels can not be installed in bathrooms. The high humidity and moisture associated with a bathroom can cause the electrical components to rust, spark, and potentially start a fire. As if that were not dangerous enough, look at the water heater. It’s a gas water heater. When the bathroom was fitted into this laundry room, the owner, with good intentions, also installed an exhaust fan. The exhaust fans pull the moisture laden air from the bathroom, and distributes it to the exterior of the home. Compounding the problem, the dryer also pulls air from the inside of the home and distributes it to the exterior. The problem is that the gas water heater needs combustion air to burn, and the vent exhausts the combustion by products such as Carbon Monoxide to the exterior of the home. 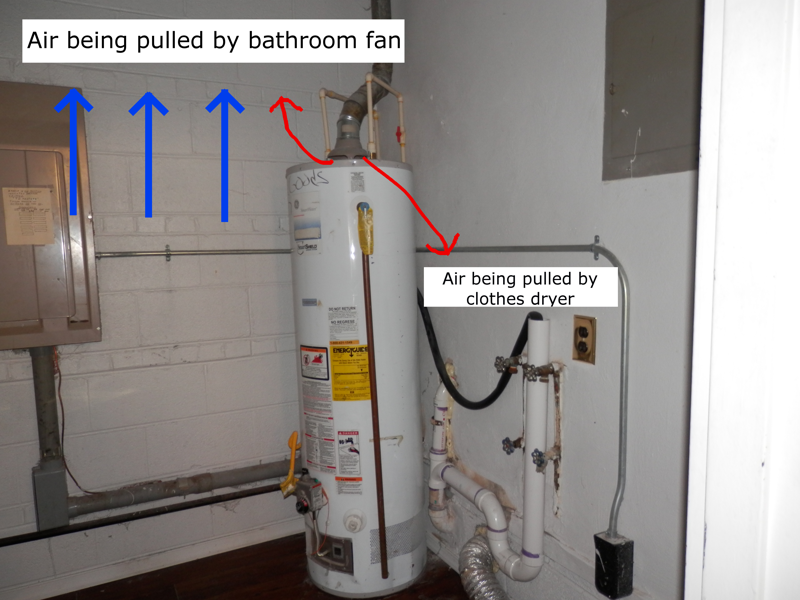 When the exhaust fan, the dryer, and the water heater are all on simultaneously, it is possible that the Carbon Monoxide can be pulled back into the home causing asphyxiation to residents in the home. There are cases of people dying from this exact scenario.